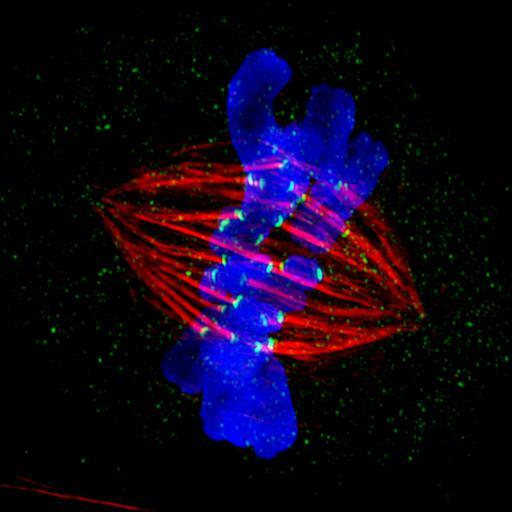 Shown is a mitotic PtK2 cell at metaphase immunostained for microtubules (red) and kinetochores (green) with DNA stained blue. The image was obtained using structured illumination microscopy (SIM, Deltavision OMX system) which provides 'super-resolution' beyond the diffraction limit set by the wavelength of the illuminating light. The micrograph was the 2012 winner in the high- and super-resolution microscopy category of the GE Healthcare Life Sciences Imaging Contest, and featured in the NIGMS Biomedical Beat, the monthly digest of notable NIGMS-sponsored research. PtK2 cells were grown on poly-L-lysine-coated cover glasses, treated briefly with an extraction buffer containing CaCl2 and Triton X-100 to remove unpolymerized tubulin, followed by fixation for 20 min with 1% glutaraldehyde in extraction buffer. After quenching in sodium borohydride, cells were immunostained for microtubules (primary antibody mouse DM1-alpha, secondary antibody donkey anti-mouse [-Xrat] Dylight 594, red), kinetochores (primary antibody rabbit anti-CenpE, secondary antibody donkey anti-rabbit-Alexa 488, green), and chromosomes counterstained blue with Hoechst dye. Images were captured and processed using a Deltavision OMX 3D-SIM Super-Resolution microscopy system in which structured illumination provides resolution that exceeds the diffraction limit. Through-focus Z-stacks of images were obtained with a 0.125 micrometer step size and a 100x 1.4 NA UNIPLANAPO objective lens, and the z-slices subsequently processed and projected down the z-axis.